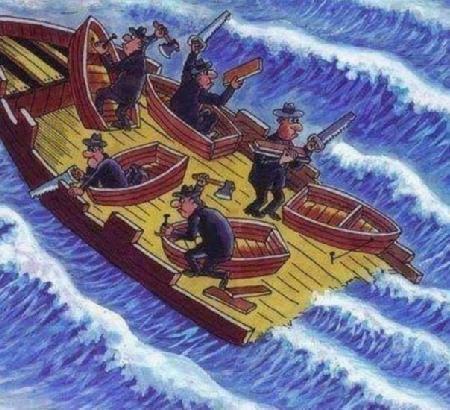 This is exactly what has occurred in Afghanistan since 2003. Worse than this is the fact that every 6 months, each organization stops what they are doing, looks around and heads in a different direction. About every 18 months, the cycle of stupidity circles back around to exactly the same priorities and organizational structure as before. The United State Army reinvents the wheel in Afghanistan on average every 18 months. The State Department has their own wheels that they keep re-inventing as well. And no one communicates with anyone else. The only continuity has been the contractors who have been there, done that, seen it all. Contractors are exactly the last people whom any United States organization would ask for advice, assistance or guidance. This is so despite continuity being the exact reason for which Contractors are hired. Most Contractors work closely with the US Military and State Department. Even so, when it comes to major decisions, the way ahead or guidance, Contractors are usually the very last persons whom the US Military will seek out for input. It is amazing. I’ve seen the same programs attempted and failed at least three times each. And still the worm turns…It is almost as if we want to fail. Reblogged this on The Dirty Rotten Contractor.